Courtni Reese serves as a guiding light for young students. An aspiring teacher, Courtni Reese ’18 will make a daily impact on young lives with the help of her scholarship. Courtni’s scholarship helped make attending the University of Georgia possible. An early childhood education major, she wants to make an impact on young lives through teaching. Growing up, many of Courtni’s peers did not plan to go to college. 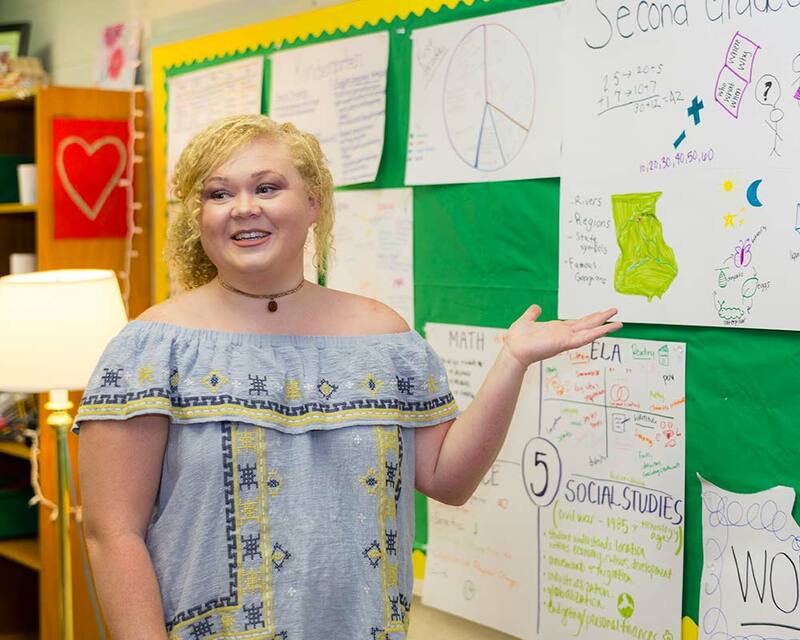 By focusing on rural education, she hopes to encourage more students across Georgia to view college as an attainable goal. At the University of Georgia, Courtni Reese ’18 has found her independence. Growing up, she never pictured herself leaving Bowdon, a small city of around 2,000 people in Western Georgia. Now, she can’t imagine what her life would be like if she hadn’t ventured to Athens to attend UGA. In the future, the early childhood education major hopes to encourage more students in rural areas to attend college. Upon acceptance, Courtni was awarded the Gee and Susanna Kane Scholarship. Funded by Susanna and George Kane III, parents of two UGA graduates, this scholarship supports students who demonstrate a financial need in affording tuition. Not only has Courtni’s scholarship helped her financially, but it also gives her confidence in her abilities as a student and future teacher. Now, Courtni has taught at four schools in Athens-Clarke and Barrow counties. Each school has students from a range of cultural and socioeconomic backgrounds. Her education has been enriched by exposure to their diverse experiences. Courtni plans to pursue a graduate degree in guidance and counseling. Her current scholarship will help her financially plan for furthering her education after graduation in 2018. And with the Kanes’ generous support, Courtni is well on her way to doing just that: changing the lives of young people by simply believing in them.